The following methods are used to empower your service with Changelly exchange features. You can request more features by contacting our developers team. Changelly API is a white-label exchange solution. Please read for better understanding https://medium.com/@Changelly/changelly-api-to-robust-your-crypto-business-25f5030bc803. The usage scheme could be useful for you. You can also connect at [email protected]. After setting up an API key you may want to set up your API extra fee. For example, you may choose to charge a 0.5% fee (we can set up any commission you want). Our fee is fixed at 0.5%. Thus, your users should pay a 1% commission in total. To set up an extra commission, please email us with a link to your service. Your API extra commission is included in a result of getExchangeAmount function call. All fees are always in output currency. 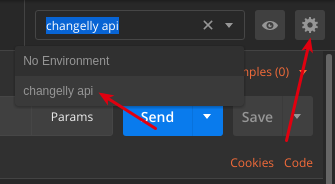 Postman Collection and short description of API methods with examples: https://api-docs.changelly.com. You will need to set up authentication to use Postman with our API. Via getTransactions method you can get all the transactions history. Changelly API uses JSON-RPC 2.0 protocol. Id used is a custom ID generated at the client side to distinguish responses. You may use any value you want. Add sign and api-key variables to the new environment. Create new request. Being on the Headers tab add sign and api-key headers. 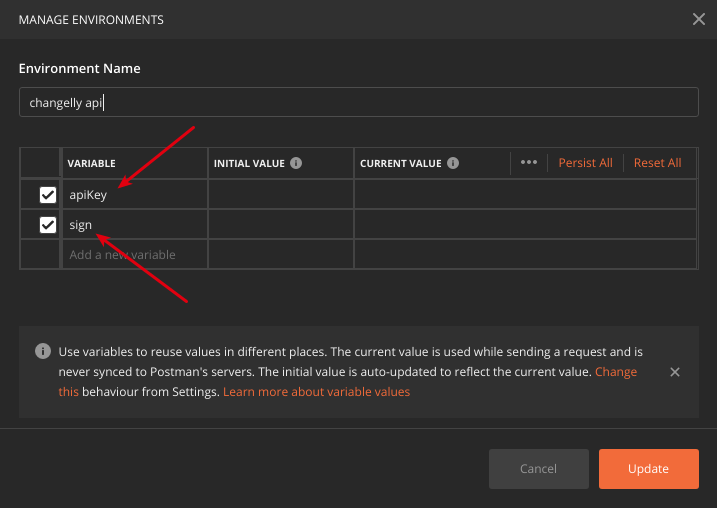 Use postman variable syntax for them in Value column. These variables will be updated for each request using the pre-request script. Paste the following code to the Pre-request Script tab for the request. Fill up the apiKey and secret variables. Be very careful not to accidentally share your secret. Note and warning: getCurrencies returns a list of currently enabled currencies. We can disable and enable any currency at any time and the response list will reflect the change. Use getCurrenciesFull to get list of all available currencies along with description and state. To proceed with exchange we need it to be larger than the certain amount. Use getMinAmount with a currency pair (from, to) to notify users of the minimum amount they need to send. NOTE: most of the users do not read the information about the minimum amount. Be sure to highlight this information in your UI. If users send less than the minimum amount, their coins will likely be lost. You can show users the estimated amount of coins they receive as a result of exchange using getExchangeAmount. You need to provide the request with currency pair (from, to) and the amount user is going to exchange. Estimated result property includes Changelly plus partner extra fee. All fees are always in output currency. Your API extra fee will decrease the estimated result. After a successful call of createTransaction method you get a unique id to track the transaction status and a payin address for user to send money to. createTransaction, once get called, creates a pair of deposit and payout address. If somebody sends coins to the same address twice, without second call to createTransaction, the coins will be exchanged and sent to the user's payout address. Note: amountTo: 0 is expected. amountTo will have non-zero value when transaction is in finished state. To identify transaction the id from the createTransaction method is used. Also you can use getTransactions method to list all transactions that satisfy request params. Note on transaction processing: It's common situation when there are many transactions in waiting status when processing payin. In this case transaction with waiting status and the nearest amount is selected. And in case there are many - the earleast of them is selected. If the are no transactions in waiting status then new transaction is created automatically. All parameters for this method are optional. With the transaction ID, obtained from createTransaction call, you can get exchange status to notify your user or provide additional support. waiting Transaction is waiting for an incoming payment. confirming We have received payin and are waiting for certain amount of confirmations depending of incoming currency. exchanging Payment was confirmed and is being exchanged. sending Coins are being sent to the recipient address. finished Coins were successfully sent to the recipient address. failed Transaction has failed. In most cases, the amount was less than the minimum. Please contact support and provide a transaction id. refunded Exchange failed and coins were refunded to user's wallet. The wallet address should be provided by user. overdue We did not receive any payment since 36 hours from transaction creation. As well as JSON RPC, the API provides socket.io interface for receiving exchange status. The subscription should be signed and have a valid logon message. For fixed-rates we’ve added two methods in our API: getFixRate and createFixTransaction. We also propose you to notify the users when their transaction is held for KYC, using API ‘Hold’ status. You are welcome to check the example of such notification. — You provide the first line support from your side and send your tickets directly to our dedicated email address. These tickets are forwarded strictly to our second level support team. It will be assigned the highest priority. Please don't make our email public. Inform us in case the dedicated support line is needed. Feel free to request it at [email protected]. Also, send us a link to your service, confirm that you are ready to provide support from your side and you won’t share this email with your clients. The support line option is provided at the discretion of the Changelly's developer team. You can check all the transactions with online stats on the history page in your personal account.